Virtual farmer's market of funny farm animal jokes, clucked up puns, and lots of horsing around. Warning: Farm Animals Present, So Watch Where You Walk! The smell is NOT the most painful thing ahead. Q. Why did the hen cross the road? A. To prove she wasn't chicken. Q. 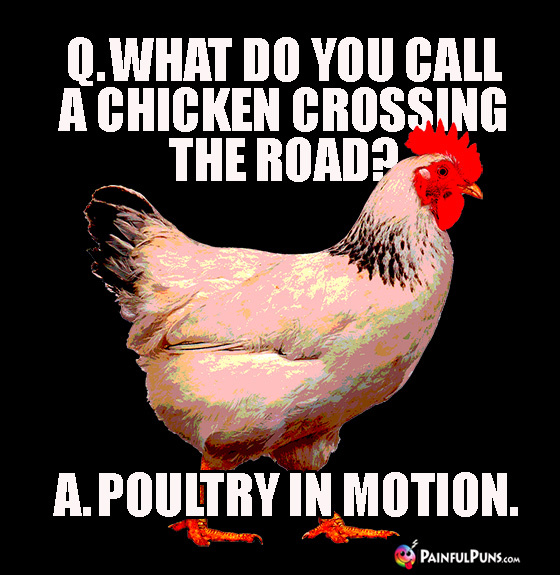 Why did the chicken stop crossing the road? A. She had absolutely no sense of humor! Q. What do you get if you cross a chicken and a centipede? A. Drumsticks for a crowd! Q. What do you call a really scary chicken? Q. 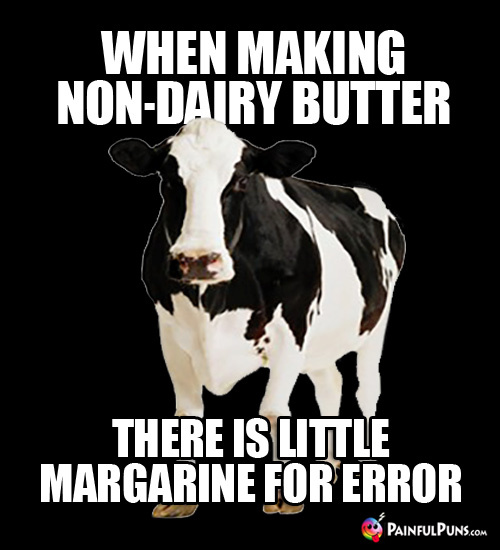 What do you get from a forgetful cow? Q. What do you get from a cowmedian? A. Cream of Wit and lots of bullcrap. Q. How do bulls drive cars? A. They just steer them. Q. What kind of car does a Texas cattle baron's champion bull drive? Q. 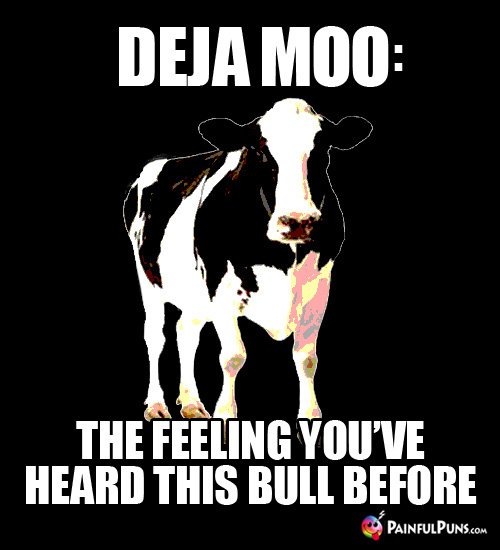 How diddle the cow get to the moo-on? A. She jumped into udder space. Q. 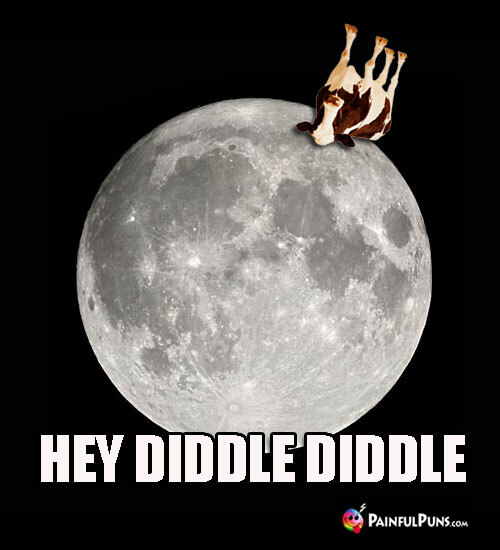 How can cows actually get to the moon? A. By using heli-cow-pters or bull-oons. Q. 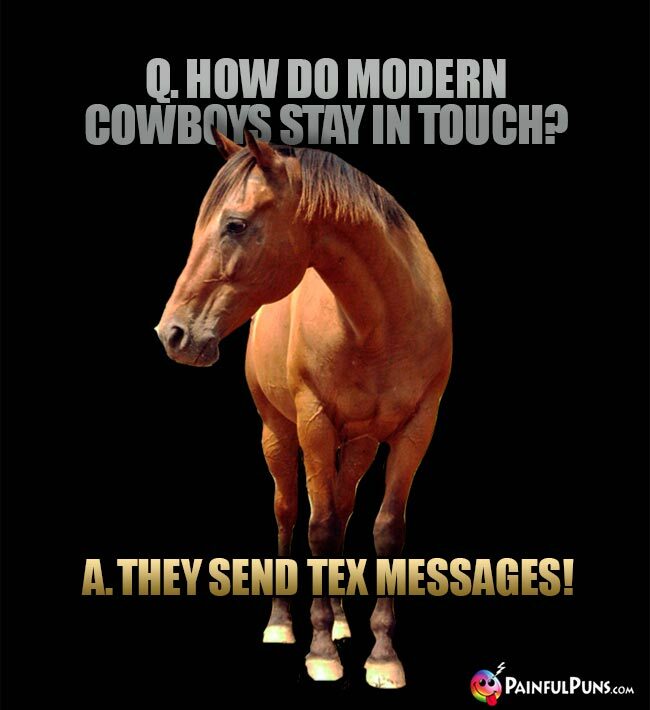 What do cows like to use when they send texts? Q. 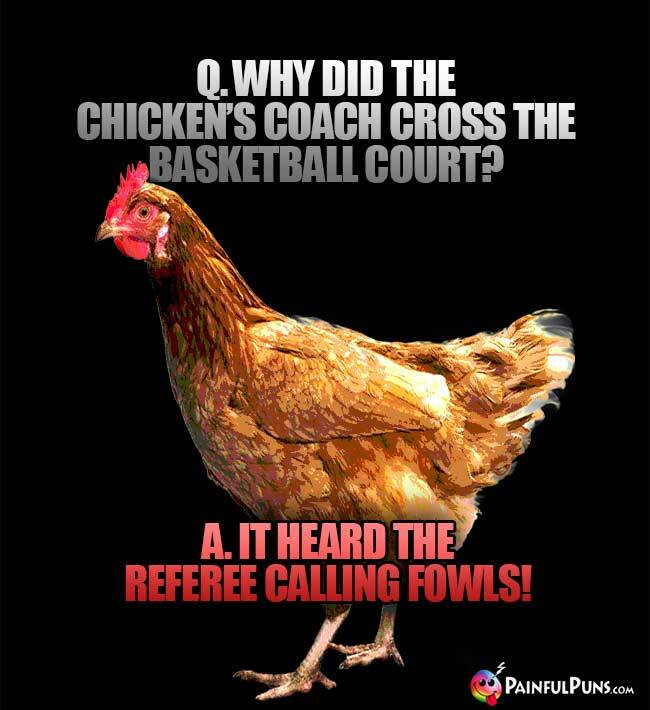 What do you get if you cross a rooster and a cow? Q. 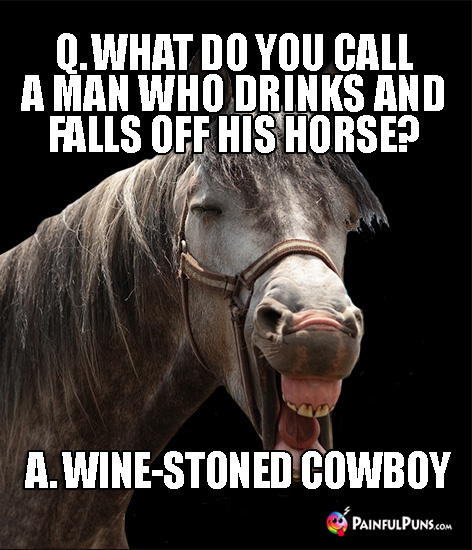 Why do horses fart when they buck? A. Because they can't acheive full horsepower without gas! Q. Why did the rancher name his horse Flattery? A. Because it got him nowhere. Q. 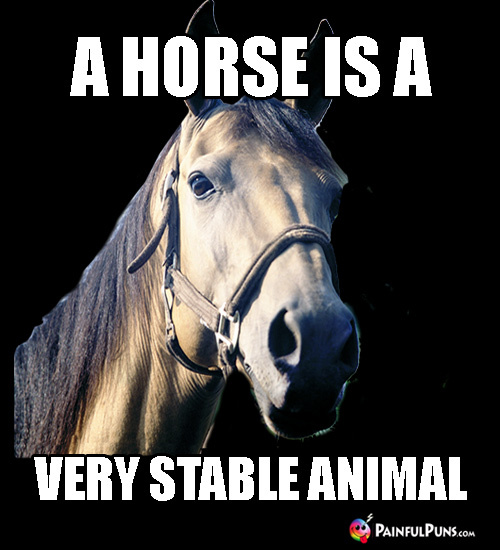 What do horses say about Painful Puns that feature equines? Q. What kind of horse do you ride down Elm Street? Q. 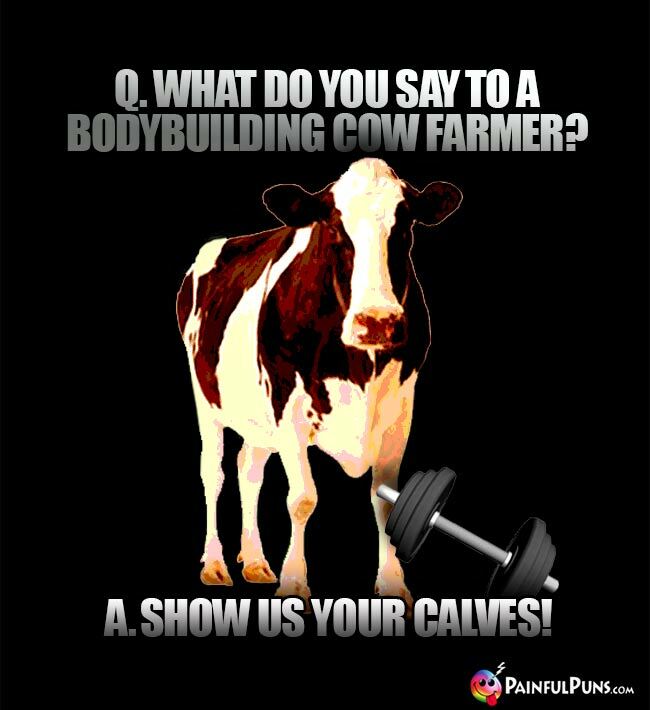 What do you get when a farmer feeds cows money? Q. What do you get if you sit under a cow? A. A pat on the head! Q. How do you best describe a grumpy cow? Q. 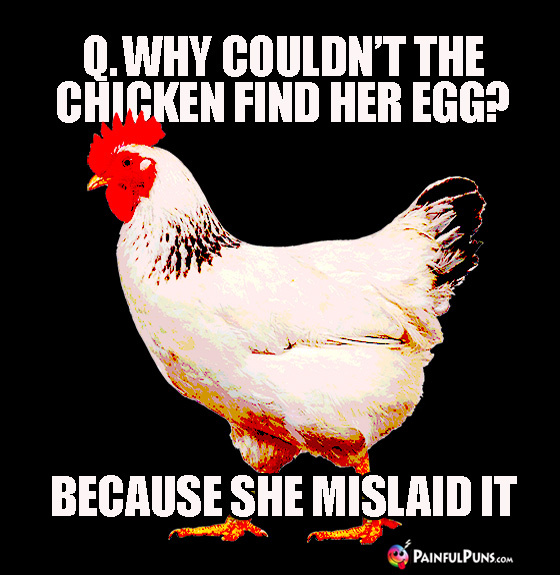 Did you hear about the chicken who only laid eggs during winter? A. She was no spring chicken. Q. How do Painful Punsters prefer their eggs dished up? Q. 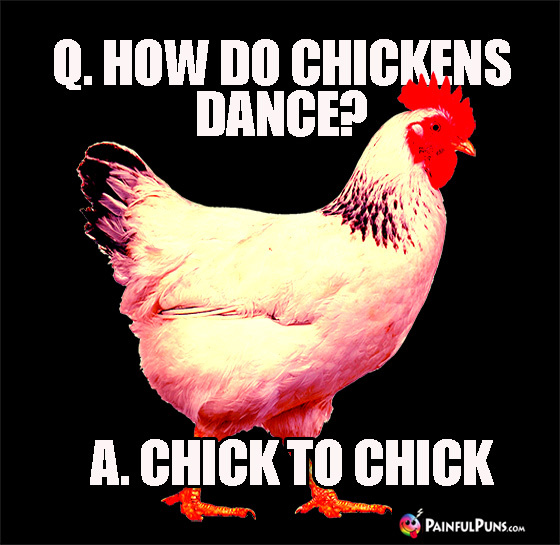 What did the chicken say when she broke out in acne? A. Oh cluck! I have the People Pox! Q. How do monsters like their eggs? Q. How do you save a horse that's been possessed by an evil demon spirit? Q. Why can't the bankrupt cowboy complain? A. He's got no beef. Q. Why are horses such bad dancers? Q. How did the dude ranch owner figure out which horse was most popular with the dudes? A. He conducted a Gallop Poll. Q. What do you get if you cross a robot and a tractor? Q. How can you tell an organic farmer is a true expert? A. He is out standing in his manure! Q. How does a farmer produce a party on Saturday night? A. By turning up the beet! Q. What's the best part of urban gardening? A. Getting down and dirty with the hoes. Q. What do you get when a duck squats? Q. 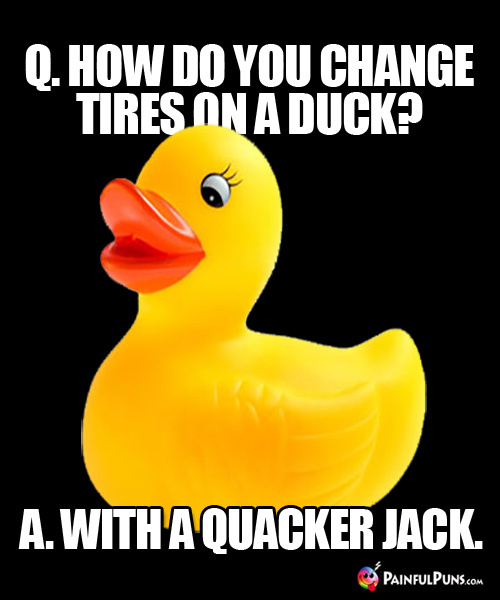 How can you tell if your duck is a comedian? A. She tells funny yolks that quack you up. Q. What do you get if you cross a chicken with a duck? A. A bird that lays down! Q. Considering that chicken rise at the crack of dawn, when do ducks wake up? A. At the quack of dawn! Today's Painful Farm Thought of the Day: If a baby pig is called a piglet, is a young bull called a bullet? Q. 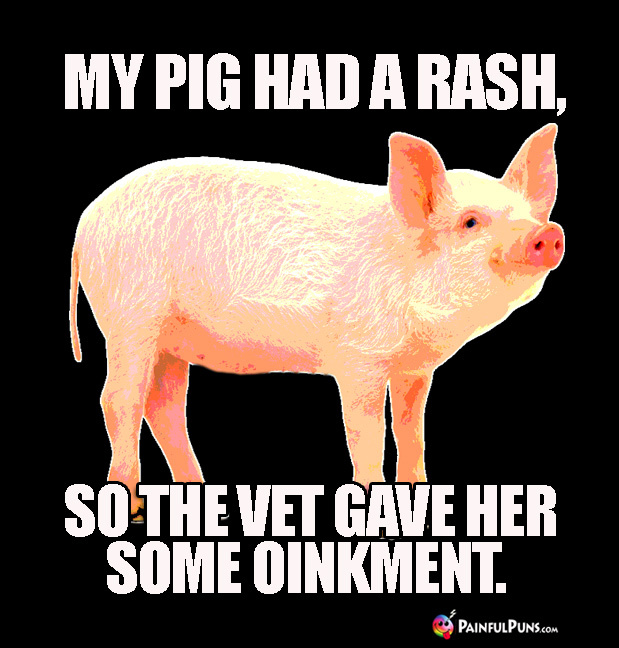 Why are pig puns so funny and interesting? A. 'Cause there's always a twist in the tale! Q. What do swine use to chat up a date? Q. What do you get if you cross a horse and a pig? Q. Why did the blonde farmer get a brown cow? A. She wanted chocolate milk. Q. Why did the blonde give her cow a hammer? A. Because it was time to hit the hay! Q. Why did the farmer put brandy in the cows' feed? A. He wanted to raise stewed beef. Q. 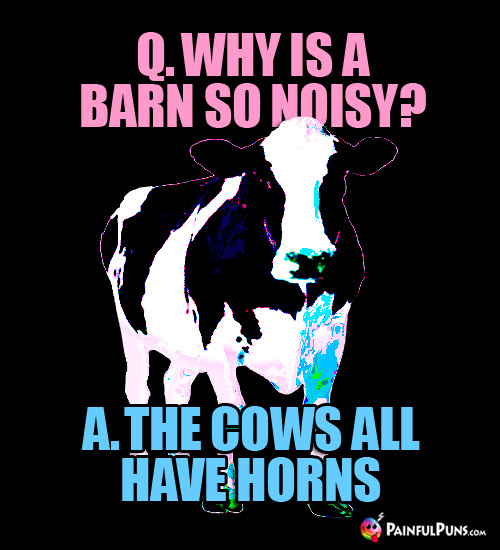 Why do cows like Painful cow Puns? A. They like being a-moosed. Q. 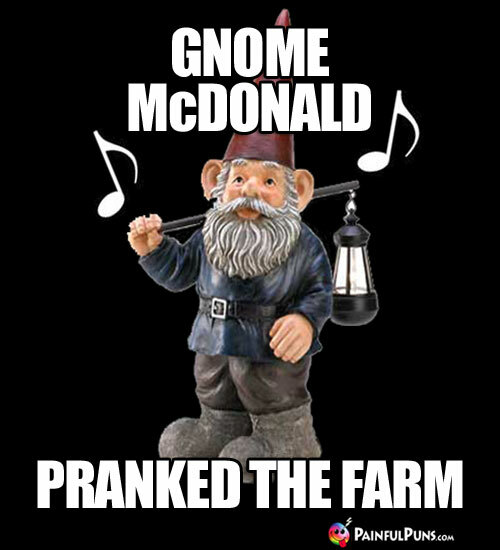 How did the gnome farmer fix his torn jeans? A. With a cabbage patch. When the farmer's wife said she was leaving him because of his unhealthy obsession with plants, he asked: "Where is this stemming from, my sweet blossom?" Q. 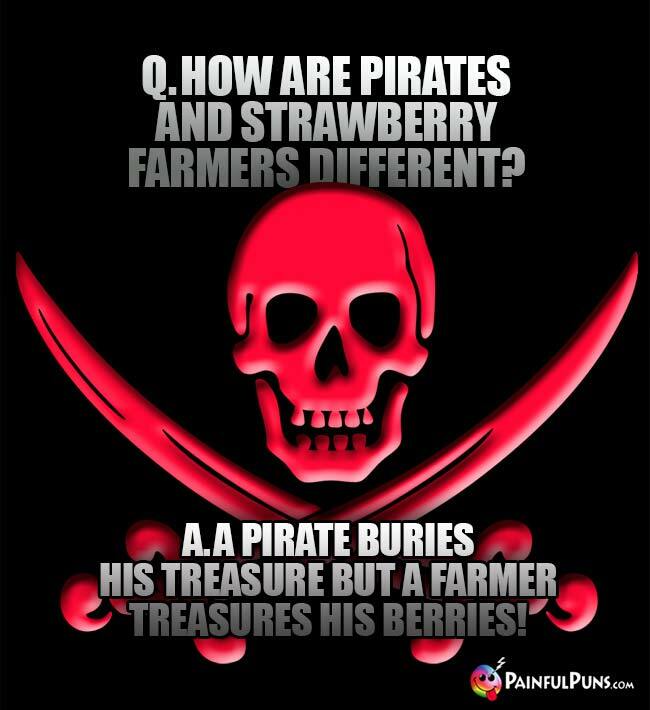 Why did the the blonde farmer wear dark glasses? A. Because she was growing sunflowers! 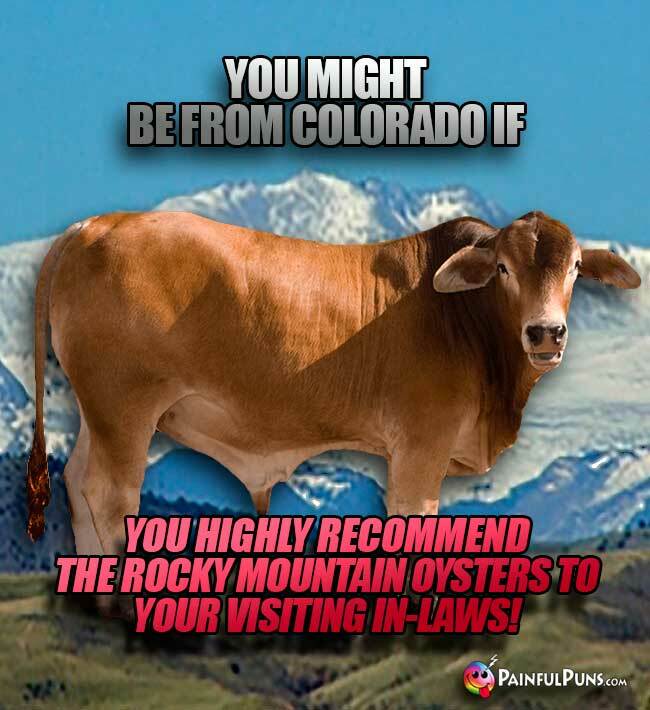 Farming Point to Ponder: Can Bok bring you Choy? 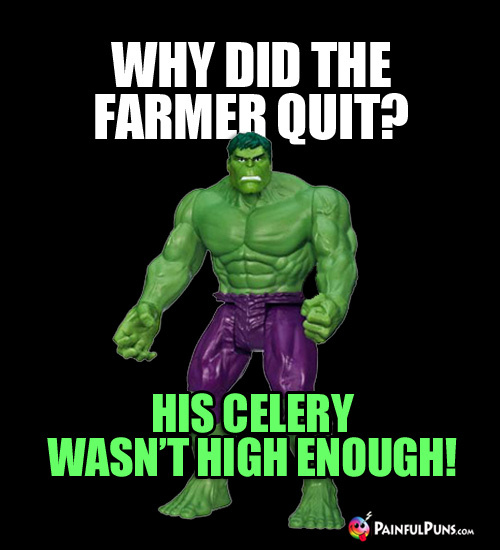 If so, then Lettuce all smile!